As regular readers of this blog will know, every month we pick one lucky customer who has left comments on our Trust Pilot Review page, and give them a £15 Amazon voucher. We do this as a small thank you to everyone who takes the time to leave us their honest feedback, as this is invaluable in ensuring we’re offering the best products, prices and services possible. 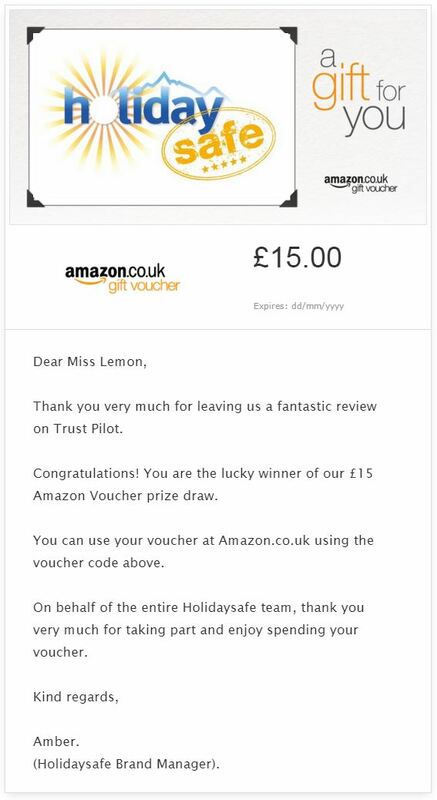 On behalf of the entire Holidaysafe team I would just like to thank Miss Lemon once again for taking the time to leave us her feedback. 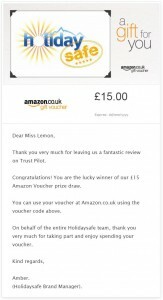 If you’re a Holidaysafe customer who would be interested in winning a £15 Amazon Voucher, all you need to do is visit our Trust Pilot Evaluation page and leave us an honest review of our products, prices and services. Once your review has been posted, you name will automatically be entered into our prize draw for that month, and we could be contacting you next!